Blackpool Pleasure Beach was recently voted the UK’s number 1 amusement park in Trip Advisor's Travellers' Choice Awards. As a well loved national brand, we were thrilled when they decided to work with us. Having invested over £15m in the park since 2011, and with the opening of Nickelodeon Land and the world's first Wallace & Gromit themed ride, Blackpool Pleasure Beach turned its focus to developing a world class website and digital marketing strategy. Its existing website was tricky to navigate, didn’t create up-sell and merchandising opportunities, and its digital marketing strategy needed tuning up to meet strategic business objectives. Our squeaky-clean strategy involved refreshing the brand logo, creating a new streamlined, responsive, and highly functional website, and incorporating a gift shop section for park merchandise and show tickets. The website is now geared towards cross-selling and product bundling, with the objective of increasing the basket value as well as boosting social engagement. We created a multi-channel marketing strategy to support the sales target – this is based on seasonal trends, with promotional codes used to boost sales whenever needed. In the spring and winter months, the focus is firmly on brand awareness by utilising platforms such as SkyGo, Display, and Social, ensuring higher converting strategies in search and social before the theme park heads into its peak season. With over 40% of Blackpool Pleasure Beach’s traffic and a huge percentage of its revenue coming through on mobile and tablet devices, it was essential the user experience was as exciting and engaging as it is on desktop. With a mobile-friendly design, the theme park is now fully equipped to benefit from an era of smartphone shopping. We introduced clear and clickable easy access navigation and tabs to keep content above the fold. A clean user interface was created with each element easily distinguishable from the next. This makes for an intuitive and stimulating user experience to facilitate sales. With features such as streamlined checkout page optimisation, it also ensured the theme park maximised its conversion opportunities. The result is a website which is fast and simple for the end user and easy to update, giving the Pleasure Beach team complete control of its marketing and merchandising platforms. It was all part of our integrated travel and leisure marketing services which ensured the theme park now stands out against its competitors. We produced a visual language which was simple and easy to understand for Blackpool Pleasure Beach’s target age demographic, creating bespoke icons to represent ride details and tickets in a format which was logical and user-friendly. We introduced an eye catching new logo which emphasised the sense of anticipation and excitement of the amusement park. A bold exclamation mark, with the application of varying colour schemes, catches the attention and showcases the sense of fun in store. The ideal strategy to keep sales boosted during off and peak season times. FacebookSegmenting the audience messaging is paramount and utilising Facebook to showcase Blackpool Pleasure Beach's promotional and seasonal offers to the eyes of the 19-28 thrill seekers was essential. PPCA complete rebuild of the PPC campaigns allowed us to rethink the approach and ensure the targeting is geared towards high ROI. Competitor insights and voucher code promotions as well as clever re-marketing. TwitterTwitter is another successful social media platform we implemented to spread promotional offers in order to increase ticket purchasing during quiet periods, growing the theme park's online reach. AdRollAdRoll allowed us to access 95% of the web's ad inventory to retarget site visitors with carefully planned ad messages. There are time-sensitive as well as targeting ticket purchasers with relevant merchandise. Major results were achieved through highly relevant demographic targeting, the careful selection of messages used in posts and page engagement campaigns, along with intelligent judgements made on the timing of posts. Take a look at what Andrew has to say about us. 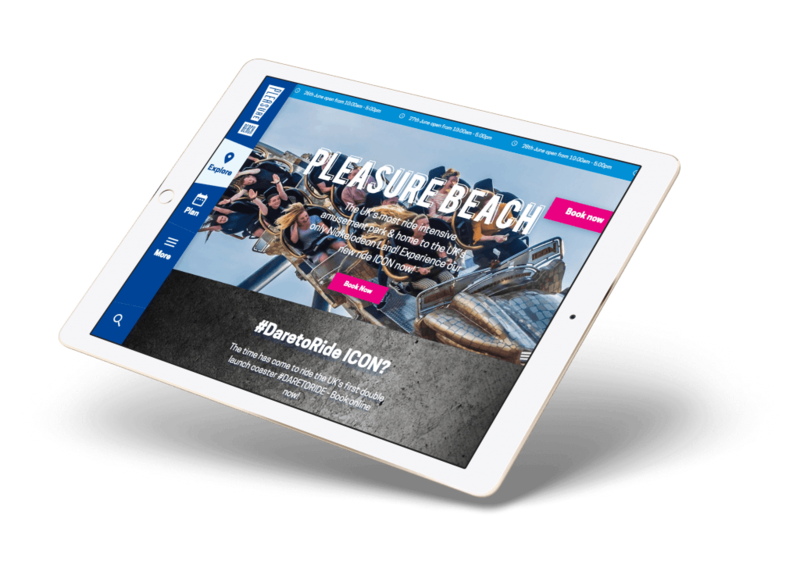 As part of Blackpool Pleasure Beach’s new digital marketing strategy, Soap Media was appointed to develop a new website and deliver a range of attendance driving online campaigns for the 2014 season. Soap Media have also integrated a new retail merchandise shop into the new website, which is fully mobile optimised and makes the online booking process possible within a few easy steps. This new website has delivered great results in improving brand awareness for our Thrill Seeker and Family audiences, and has also increased e-commerce conversions significantly. Blackpool Pleasure Beach was recently voted the UK’s number 1 amusement park in the Trip Advisor Travellers Choice Awards and has some exciting plans in place with Soap Media for the summer holidays and the remainder of the 2014 season.